Marni Rose is the first flanker to Marni, the brand's debut fragrance. It was announced as a "more intense" scent geared towards the Asian market. Now, a more intense scent geared towards the Asian market is a rare bird indeed, insofar as nearly everything geared towards the Asian market is made as light and inoffensive and clean as possible, but the claims turn out to be reasonably true. The original Marni, of course, was not exactly a powerhouse, so we are talking degrees of intense here. Still, Marni was one of my favorite fragrance releases of 2013, and Marni Rose now joins the "best of" list as one of my favorite flankers of the year.1 It does exactly what a flanker ought to do: explores facets of the original fragrance whilst still being similar enough to justify keeping the name and the packaging (they've tinted the bottle in shades of pink, and switched the red cap for a black one). You could very reasonably want to own both, and you could just as easily find that you liked Marni Rose even if you didn't quite love Marni (and vice versa: Marni lovers, do not buy unsniffed). Marni Rose tones down the spice and the "touch of masculine" imparted to the original Marni by the dry, darkish base notes, and amps up the floral and gourmand notes. The opening is bright and fruity, but quietly so in comparison to most mainstream fragrances — this is not a sweet fruit bomb. The heart is a pretty pale rose, lively at first, then subdued, with a mild but persistent undertone of almond. There is just enough violet to make a nod towards classic boudoir rose-violet blends, but no more than a nod, and the base is paler than Marni's, and a bit more powdery-smooth. Verdict: Quite nicely done. Marni Rose leans more conventionally feminine than the original Marni, but like the original, it's both wearable and sophisticated, and it's quiet enough that it could easily be worn by anybody in any weather. I did not find the original at all quirky; Marni Rose is arguably less so. If given the choice, I'd probably go with the original, but they do layer beautifully, in fact, I like the two fragrances layered better than I like either of them on its own. So purse sprays of each would make a nice compromise, no? Now taking votes: what do you think was the best flanker of 2013? Marni Rose features notes of raspberry, bitter almond, mint, cardamom, violet, rose, patchouli, vanilla, musk and cedar. It is available in 30, 65 ($105) or 120 ($155) ml Eau de Parfum, or in a 10 ml purse spray packaged with the brand's Bambolina doll (see just above, $50). 1. Or at least I thought Marni (original) debuted this year, in January, but the PR materials for Marni Rose say it's being released on the first anniversary of Marni. So either Marni launched somewhere on earth in 2012, or they just wanted to get Marni Rose out a bit early for the holiday shopping season. Ooh well I’d be very happy if Marni Rose turns out to be my favorite flanker too, but until I get a chance to sniff, Botega Venetta gets my top spot–I’d wear either of the flankers they put out this year! Hey, what 2 flankers? I only know about Eau Legere. And so glad! It does seem to work better, & works pretty well on phones now although it does take some scrolling. Gotcha…no, you wouldn’t call the masculine version of anything a flanker, even though it’s a similar marketing concept. But either way BV did a good job this year, and will be surprised if BV Pour Homme doesn’t get its own flanker next year. 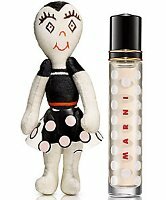 I haven’t tried either Marni scents–I keep remembering that there are scents I should try “next time I’m at the mall,” but I’m such a snob, I tend to blow it off as probably not worth the search. . . speaking of which, I don’t know that I’ve tried a single flanker of any significance all year! Can I lose my perfumista badge by being too close-minded? LOL…depends on where you say that, I’m sure there are people who would take away your perfumista badge for trying mall fragrances. But I do think Marni is worth trying. If you smelled the same juice from some niche brand, you would not think “what’s this crap they’re trying to sell me”, quite the opposite. And if I had a better memory, I could name 25+ niche launches from 2013 that weren’t even as good as whatever you can find at Macy’s. Let’s face it, there’s crap EVERYWHERE, at every price point. You are, of course, totally right! I know in my head that there are quality mall scents–and I know in all ways that there are totally boring, if not poorly made, niche scents. But I think my first year or so of sniffing around the mall turned me away from the mall–the more discerning my nose became, the more bored I got. What I probably need to do is start a “mall sniff list” so I can focus my mall outings and not have to sift through 50 pink-juiced fruity-floral-pink pepper-musks to find a treat. Hey, go to Neiman Marcus, if you have one. Their fragrance selection is way better than most — not too big, nicely focused on decent brands. I admit it’s dispiriting to spend much time sniffing at Macy’s or the like. I don’t have a Saks nearby, but would think that would work too. My local Nordstrom has some great stuff, but more “not great” stuff than NM — although they also have Diptyque which is nice. Sadly, no Neiman Marcus in Portland. We have Nordstroms, Macys, and JCPenney. And Sears. Lots of celebuscents to try at Sears. The “big” Nordies downtown is usually my best bet, since they have some boutique counters–Jo Malone, etc. They used to have the Chanel Exclusifs, but sadly no longer! Yeah, that might make me skip the mall fragrances too. I have to drive quite a ways to get to NM, so I don’t go often myself. I’m pretty sure I’ve tried BV, but not the homme version. Any other mall sniffs I should put on my list? Pretty sure I’ve never seen the Prada scents Lucas is always raving about, but it’s probably worth another check. . .
You’ve never tried ANY of the Pradas??? I’ve tried Infusion d’Iris, which I blind bought a mini of early in my perfumista-hood. I can’t recall looking for others in my mall-wanderings. Seems like the should be at Nordie’s though, huh? Haha fun times! Do try the Absolue of Id’I, in that case! And for my tastes, the Candy L’Eau seemed more plausible than the original, so if you think you might like something not-quite-so-sweet, it’s worth a shot! What else… Did you like Elie Saab? If so, the Carven is worth trying. The Jo Malone Cologne Intense Saffron isn’t my particular cup of tea, but it has more body than many JMs. My Nordie’s often has a good selection of the Annick Goutals, if you haven’t tried all of them yet. Whatever they have on hand from Cartier that you haven’t tried yet prob also merits a sniff (the various Baiser Volés, Declaration–alas I think the L’Heure series is exclusive to Saks but some of those are nice too if Nordstrom’s have them). If the Coach Leatherware scents end up in as wide release as the rest of their offerings, that will def be worth smelling. …actually, it’s kind of the best parts of newbie status–that’s a lot of fun stuff to look forward to! Ha, then you’ve tried the best Prada anyway. And sorry, just seemed, well, unusual! Prada’s not that hard to find, after all. Well, I haven’t tried this one, but I really didn’t like the original Marni, for some reason, so maybe this isn’t going to work for me for best flanker in any case. Haven’t tried Joy Forever either. Maybe Loverdose Tattoo? I didn’t try Joy Forever either, & Angie’s review didn’t really inspire me to track it down. Loverdose Tattoo is great, definitely on my list of best flankers of the year. So glad you like it too. Diesel is a funny house, had almost forgotten how much I liked their pre-Fuel-for-Life fragrance line, before they moved to L’Oreal. Wow, just based on the name, Loverdose Tattoo would have to be one of the last fragrances I would ever expect to smell good, but if you and Robin say so, I have to believe it’s worth trying. I really like the original Marni and am glad it has the masculine notes so I’ll keep wearing mine. Rose and I don’t do well at all unless it is a dark rose that knows to step aside like in Tom Ford’s Noir de Noir. Clearly houses are reading reviews on various media including blogs rather than just wait and see if a fragrance makes it or not as in the past. So I am expecting that flankers become more successful than originals moving forward. A man could wear Marni Rose, but guessing most men will prefer the original. And hey, that Diptyque was one of the rare flankers that I thought was better than the original pillar scent. Oooh, thanks for reviewing this. I might have to hunt down a sample since Marni is probably my favourite release this year so far. Ah, then do try them layered! Now I’m thinking that layered over a not too sweet almond lotion would be fantastic, only I don’t have an almond lotion to test. Better yet, a not too sweet biscuity almond lotion, if anybody makes such a thing. Oh, thank you for the review Robin! I’ve been thinking about this one and you sold it! Merry early Christmas to me. I think it’s going to find lots of perfumista fans. Hope they’ll do a new pillar fragrance in 2014, I’d like to see what they’ll do next. On an unrelated note, my SOTD is Rose Jam perfume from Lush. Thanks a million, Robin, for telling us about its availability! My bottle should last a long time — one small spray has lasted for hours. Great stuff! Wonder if you’re anosmic to something in the blend? In which case, you might not smell much here either, don’t know. You got it already!! Congrats. I almost decided to buy unsniffed, but didn’t. Still hoping to score some of the shower gel. Ummm, I was a bit naughty and paid for expedited shipping While I love the smell of fresh roses, rose perfume can bore me after a while (I think that I borrowed that from another NSTer). I think that it might be too sweet for you, but if you do buy it and it doesn’t work out, you will have no problem finding a good home for it Hopefully, you can at least score the shower gel. Thank you — very good to know, because that was my main worry (too sweet). I think I might like it better in a shower gel then. So glad you got it and like it! I didn’t pop for the fast shipping and felt the green tinge when I read you had received and were already wearing yours. I am neither a fan of rose nor sweet, but I love this. Dirty secret: I ordered two bottles. Very wise to purchase two bottles. I hope that you enjoy it as much as I do. Like the shower gel, it is potent, so apply sparingly. ooh- didn’t know they’d gotten the perfume. The rose jam shower gel was quite yum but there are a million another things I want to buy first so I’m thought I wait on that one- the perfume will be harder for me to resist though. It’s limited edition — if you want it, you might want to get it soon. I guess I’d better try this Rose Jam everyone is raving about:). Yeah, I’m feeling like I’m seriously out of the loop on this one! We have a Lush downtown, but I’ve never gone inside. Same! I went in once, and the SA did what should have been a cool blind-sniff thing, but I just ended up really overwhelmed (smelling 20+ fragrances under unlabeled bell jars gets confusing fast, it turns out!) and left without putting anything on. I should go back and try again with more modest ambitions. There must be something special about it if it has won over J.J. who is a fan of neither rose nor sweet In the perfume, like the shower gel, I smell a very jammy rose, lemon, honey, and vanilla. Your notes are spot on, KC. Sweet but not cloying. I wish the made a talc. Heck, I wish they made a margarita! A little takeaway opened nearby recently. I just picked up some root beer glazed ham, buttermilk mashed and a praline chocolate tart to tide me over the next few days. Life is fragrant, delicious and good! Bring on the prismatic arcs and them two-toned bears. I am in! JJ, your meal sounds decadent! I haven’t tried Marni or any of the flankers mentioned thus far. I really haven’t sniffed too many flankers this year, I don’t think. So, I guess I don’t have any to nominate. I did sniff a few flanks that I didn’t like though. :D, I’d wear the scent of a flank steak before MJ Honey:). I’m looking forward to trying this; I really like the original Marni, but it didn’t work with my chemistry. Maybe this one will. My favorite flanker for this year is Baiser Volé Essence. It was absolutely heavenly on me. My samples are gone and I’m hoping to find it or the original in extrait under my tree this year. Cartier has done such a great job with BV & all its concentrations. Really impressive. I loved the spiciness of the original Marni but I didn’t buy because it was very fleeting on me – I am going to try it again next time I can find it and spray it on fabric to see if it lasts longer. Will try the Rose too – even though it has mint in it. I think my fave flanker is between Bottega Veneta or Manifesto L’Elixir – a lovely comfort scent. I don’t think you’ll find the mint heavy — I hardly noticed it. But do report back if you find it too much. ooh- I didn’t know about the flanker. I really liked the original and even succumbed to a bottle (albeit on ebay). Will be interested to smell this.. I bought the original Marni because I’m not a big fan of rose, but I do love how it’s subtle, and combines with the spices so nicely. So, I’m not sure if the flanker would be too rose-y for me. Must get a sample to try! It might be…it’s not heavy, but it’s way more rose-focused. Robin, if you are looking for an almond scented lotion, try Aveeno Creamy Moisturizing Oil, which has a nice, light almond scent. It can be found at any CVS or Walgreens. I need to go back and try the Bottega Venetta flanker again – I sniffed it briefly at Nordies and liked it, but actually liked the Balenciaga Paris Rose flanker more (I am a rose lovah). I have to check my local Lush to see if they now have the Rose Jam perfume … hopefully they have stocked up in preparation for the Black Friday rush. Oh, good to know, thanks! I liked that Rose flanker too. I don’t think the Rose Jam perfume is supposed to be in stores, pretty sure it’s online only. But I have been wrong before! This sounds lovely and worth a sniff. Sorry you are waiting so long! But you’ll sniff Rose Jam before I will, if that helps. I will have to try the body lotion. Actually, this over the “regular” body lotion might be perfect. I tried this at Saks last week, walked around to smell a few other perfumes and all the Tom FOuds. I caved and bought a FB of Marni Rose. I did not think to layer it with original Marni but I will. Thanks for the layering tip, Robin. As to a favorite 2013 flanker, I will cheat a little (or maybe a lot) and say that Cartier BV Blossom is my favorite not on me but on my sister. Her skin amps up the cognac aspects whereas mine amps up the honey (which is why I keep thinking the name is CBV Honey). Oh, good for you! And it’s a lovely bottle. Do try them together. Baiser Vole Blossom? Is that new? Hadn’t even heard of it! But now I want some. Ha…no worries, who can keep all these names straight anyway? Whatever it’s called, I should have some. Or the extrait. Although really I think it’s a pretty scent in every form. Was it this year that Diptyque issued EdPs of L’Ombre dans L’Eau and some other, or last year? I’d probably like those best if I had tried them. More guessing: at least one of the Thierry Mugler Les Liqueurs de Parfums reissues should be great. Also, aren’t the Yohji Yamamoto reissues (reformulations) out somewhere? As you can see, I haven’t tried a single flanker and am just blatantly guessing. I also thought this was from 2013, but when I checked Fragrantica, it said 2012. Otherwise it would definitely be one of my favorites of the year. Haven’t tried the flanker yet but it sounds great! BV Eau Legere would get my vote as well. BTW I have an article on flankers forthcoming on BdJ in December! I still say it’s 2013…they may be dating from the announcement. I always date from when it goes on sale. I’m looking foward to trying this and the original one (especially the original one, as it has more masculine undertones).